Wellframe founding members are from left to right: Dr. Jacob Sattelmair, Chief Executive Officer; Archit Bhise, Chief Product Officer; Dr. Trishan Panch, Chief Medical Officer; Vinnie Ramesh, Chief Technology Officer. All images courtesy of Wellframe. Could Mrs. Black’s admission have been prevented? The charcoal drawing hanging near the entrance of her room enveloped half of the wall. The intricate, detailed scene of a tropical ocean view was stunning, but I could see it was unfinished. Mrs. Black noticed me admiring it and smiled: “My late husband painted that. We loved painting.” The other painting faced the north wall, but it was acrylic on canvas. It was significantly smaller but far more colorful. This one, she told me proudly, was one of her own. She had painted a rainy scene of a Parisian café full of ladies with gorgeous umbrellas. “I love Paris, I could live there!” Mrs. Black told me. And with that, we began chatting about her travels and health. My attending had wanted me to go into the encounter blindly—without reviewing Mrs. Black’s chart—and come back with evidence for a diagnosis after 30 minutes. I spent nearly an hour with Mrs. Black, the first person I had the opportunity of getting to know at a nursing home. I’ll never forget her. Although Mrs. Black reported she was 60 years old, she was a witty, bold woman with a jolly spirit who seemed much younger than her age. I was shocked to later learn she was actually 80 years old. When asked what brought her to the nursing home, she simply said, “A doozy of a fall.” She had tripped over her feet and tumbled down seventeen stairs. After two weeks at the nursing home, she said she was ready to go home and be with her husband. Then I realized something strange. Was her husband alive? Had I heard her incorrectly at the beginning? Then details of her children, whom she had described to me at the start so thoroughly, suddenly now fused together with the histories of her siblings. My mind began racing with differential diagnoses for memory loss and cognitive impairment. Mrs. Black reported she fed, dressed, bathed, toileted, and “did everything” independently. She denied any prior history of diabetes, hypertension or other health issues. She couldn’t remember what regular medications she took. On focused questioning in her review of systems, Mrs. Black noted that she didn’t feel quite as sharp, and that her heart beat too fast at times. On physical exam, I closely listened to her heart. An irregularly irregular rhythm and a diastolic murmur were appreciated. Vascular dementia crept up to the top of my differential. Her neurological exam was positive for peripheral neuropathy. I wondered if she suffered from diabetes. When I screened her mental status with a MiniCog test, she scored a zero. If I had not seen it for myself, I would have never thought Mrs. Black to have severe dementia. When I returned to my attending and began reviewing her chart, the medications and diagnostic lists resembled a medical encyclopedia of chronic diseases: diabetes, hypertension, atrial fibrillation, cardiovascular disease, chronic obstructive pulmonary disease, chronic kidney disease, degenerative joint disease, cancer, and more. At admission to the nursing home, a recent MRI showed evidence of a cerebellar stroke, which may have explained her fall. She had several chronic diseases and risk factors for stroke and vascular dementia. Being a prevention-driven and public health-minded individual, I was frustrated by the difficulty in coordinating care for people such as Mrs. Black. If I, a healthy 20-something, find it difficult to remember to take one daily multivitamin, how could someone as chronically ill as Mrs. Black manage her scroll of medications? Chronic disease monitoring seemed medically intimidating, particularly since the numerous specialists who saw Mrs. Black all had different physical exam reports. I understand how these things can occur. Taking a full, detailed history of someone with dementia can require more time. As the medical student, I have that time. With off-kilter medical payment system models, many physicians historically have limited time to do so. Mrs. Black helped me understand the reality of managing medically complex patients and the gaps in the healthcare system that may occur. I started thinking of the potential incorporation of technology in chronic disease monitoring. Would she have developed dementia or fallen if she had better management of her chronic diseases? Could her stroke have been prevented if her heart disease was better controlled? I know there is no cure for dementia; I realize the ultimate goal is to keep Mrs. Black—and those suffering from chronic diseases—as symptom-free as possible while preventing potential serious complications. It saddened me that she was not able to remember me when I dropped by to say hello the next day. Medication management of chronic diseases is a serious problem with serious implications for an increasing aging population. It is going to take a group of dedicated physician visionaries to usher in change and seal our highly fragmented healthcare system. Among them are physicians Sachin Jain and Trishan Panch. Dr. Jain is the chief medical information and innovation officer at Merck, where he formed the Merck Medical Information and Innovation team (M2i2). M2i2 is building an ecosystem of strategic collaborations to enhance health IT and data-driven capabilities with the goal of improving public health, clinical care and patient engagement. Dr. Panch is co-founder and chief medical officer of Wellframe, a cloud-based mobile care plan platform for people who suffer with chronic diseases. With the support of and guidance by many, they are tackling the Goliath that is chronic disease management. Although our healthcare system in the U.S. does a fine job in addressing acute health issues, a wide gap remains with care of chronic diseases. According to the World Health Organization, chronic diseases, such as cardiovascular diseases, diabetes, hypertension, and hyperlipidemia are among the greatest challenges to the public health of the American people. Interestingly, chronic diseases are responsible for at least 50 percent of the deaths that occur in all World Health Organization regions except Africa, where it accounts for 25 percent of all deaths. A major rift exists in chronic disease management despite having the knowledge about chronic disease prevention and management. “Currently, patients have to really manage their chronic diseases themselves. They are the ones responsible for taking their records to their different doctors, updating the different doctors if they’ve had a change in prescription, seen a new doctor, and have been admitted to the hospital,” Dr. Panch says. “That’s a lot of burden of responsibility on the patient.”Addressing this problem was the goal for the Merck and Heritage Provider Network Innovation Challenge. Enter Wellframe, winner of the Merck/Heritage Provider Network Innovation Challenge, aiming to connect patients to care by simplifying care plans and enabling relationships. With the goal of stimulating the best ideas in improving chronic disease management, Merck and the Heritage Provider Network teamed up to start their first innovation challenge. At its core, Wellframe is empowering people who suffer from chronic diseases with a GPS navigation system for managing their health. One application of the Wellframe system that has facilitated greater connection between providers and patients, reinforced compliance, and reinforced adherence is Cardiac Rehab – the evidence based protocol for treatment and secondary prevention of ischemic heart disease (Fig 1). The Wellframe Cardiac Rehab program, Heart Coach. Photo courtesy of Wellframe. The Wellframe Cardiac Rehab program, called Heart Coach (HC) features a daily checklist and a library of reference educational content. According to an article in the Journal of Cardiac Rehabilitation, the HC application was “built on the Wellframe platform that used a logic and content structure to represent an established protocol of cardiac rehabilitation used at South Shore Hospital (based on standard American Association of Cardiovascular and Pulmonary Rehabilitation guidelines). New tasks were delivered to patient mobile devices each day as parts of a progressive, programmatic treatment plan.” Patients have step-by-step guidance and human support. Wellframe leverages technology to better assist patients in managing their chronic diseases. It provides daily guidance, objective tracking, and social support. It helps lessen the communication gap between patients and health providers, maximizing patient engagement and retention. When provided with spoken medical instructions, studies show that patients can remember only 14% of the information. Wellframe addresses this problem and helps enhance patient-health provider communication. “Oral directions given to the patients in fleeting interactions with clinicians every few months are very difficult for them to digest and thus act upon,” Dr. Panch notes. “One of Wellframe’s key features is delivering short, easy to understand messages to the patient every day to allow them to slowly understand the bigger picture of their chronic diseases and also be more compliant.” Wellframe is addressing the communication gap, thereby bridging the gap in medication adherence. Wellframe assists both patients and medical providers. 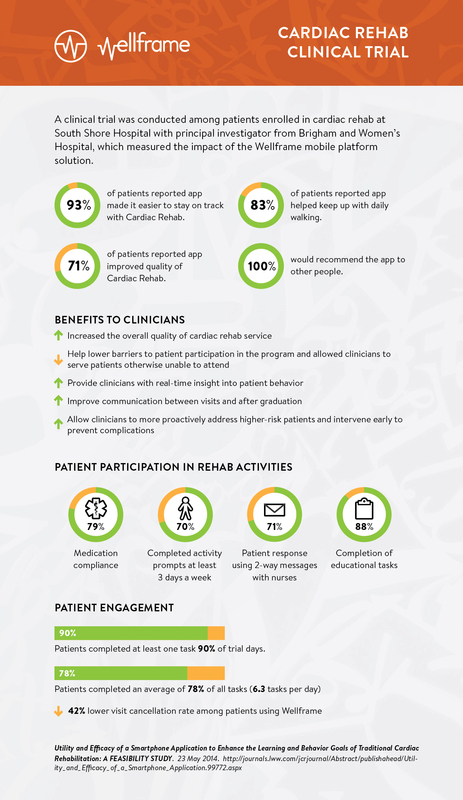 One study in the Journal of Cardiac Rehabilitation reported the following benefits of using Wellframe to clinicians: It increased the overall quality of cardiac rehab service, helped lower barriers to patient participation in the program and allowed clinicians to serve patients otherwise unable to attend, provided clinicians with real-time insight into patient behavior, improved communication between visits and after graduation, and allowed clinicians to more proactively address higher-risk patients and intervene early to prevent complications. When asked about the opportunities that led Wellframe to where it is today, Dr. Panch lists policy, technology, and favorable costs. With respect to policy, people began thinking about new ways to deliver care as a result of the change in the medical payment system. The sheer explosion of our technology-enabled society is unprecedented, with widespread use of relatively inexpensive smart mobile devices ranging from smartphones to tablets. Moreover, the process of managing chronic diseases has become increasingly codified and driven by evidence-based medicine. “Certain outcomes are being measured that evidence suggests is key in managing chronic disease, e.g, hemoglobin A1C,” Dr. Panch says. “The barrier to entry on the technology side has decreased, including the use of cloud storage.” In a nutshell, favorable costs = Murphy’s Law. Taken together, these factors helped signal that it was the right time for a solution like Wellframe. Like most powerful revolutions, Wellframe starts by rehabilitating hearts. To those skeptics thinking that Wellframe is only for “young techies” and that the growing aging population suffering with geriatric syndromes may have difficult adoption, think again! This point is addressed in a feasibility study in the Journal of Cardiac Rehabilitation. According to one study, “High levels of engagement and positive feedback from patients and the multidisciplinary care team were reported. Notably, one-third of patients were aged 65 years and older and these senior patients did not report any extra difficulty using the technology.” Dr. Panch reports that the team is currently studying the implications of these results and the potential transferability to other geriatric syndromes. By providing patients with step-by-step guidance and contact with the health providers who care for them, Wellframe combines mobile technology, artificial intelligence, and human-centered process design to connect people and amplify care.“The patient is the producer of their health. What we want to do is connect people at the point of care,” Dr. Panch says. While improving accessibility and outcomes in programs like cardiac rehab is the start, Wellframe continues to grow, becoming available in many languages such as Arabic and French. With promising, dynamic data-driven results, Wellframe could play an integral role in well-framing chronic diseases and preventing the number of severe medical complications for people like Mrs. Black. I wonder if Mrs. Black had used Wellframe, whether we would have met at the nursing home that day. I’d like to think that her stroke and fall would have been prevented, and that her vascular dementia would not exist. I like to think that she would be home safe painting with her grandchildren while easily managing her chronic diseases. I wonder if we would have met another way. Perhaps our paths would cross at a local grocery store, or in a Parisian café on a rainy day. While enjoying hot lattes, we would discuss art. And maybe, just maybe, we would have coffee again the next day and she would remember me. Sara Dawit is a third year medical student at the University of Kansas School of Medicine. She writes about neuroscience, culture, preventative medicine, and healthcare innovation. She studied molecular biology and humanities at Scripps College. She has broad leadership experience and a strong research background, having seven years of experience in both translational and benchside research at Scripps, Mayo Clinic, H. Lee Moffitt Cancer Center & Research Institute, and the Centers for Disease Control and Prevention. She has published research and presented work at national and international conferences. Follow her at @sara_dawit.